I talked about writing this post for months but I always thought I wasn’t ready, something was missing another thing not perfect yet. 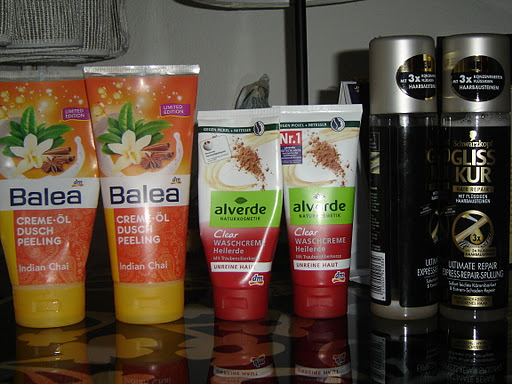 Then again, I’ve been using the same stuff for months now and even re-purchased a shampoo, which usually doesn’t happen, since I never found one that seemed worth it. So I decided to ignore everything that was not perfect yet and dive right in, I mean, I can always post updates, right? 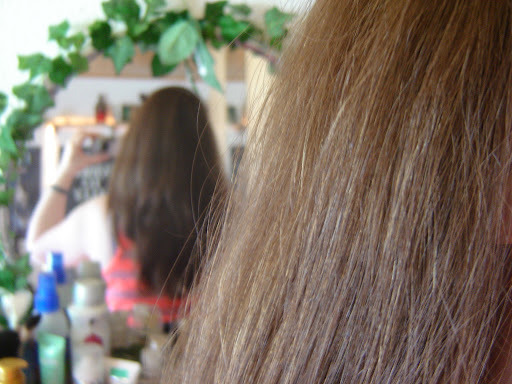 I was blessed with rather thick and sturdy hair in a nice reddish brown color. 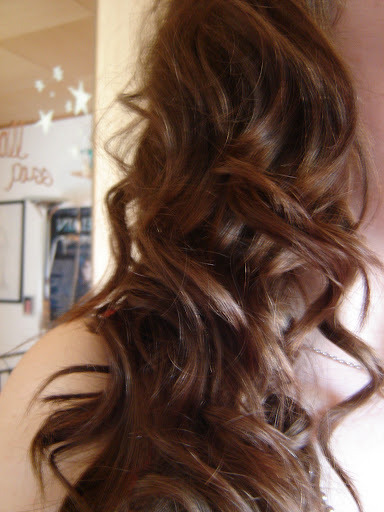 My hair was so thick and sturdy in fact, that an old hairdresser of mine complained she couldn’t handle it. Needless to say I switched the hairdresser after that. I mean she is the expert, if she can’t handle my hair she can’t be really good, eh? Over the past I went through phases of coloring my hair and leaving it be until about five years ago, I decided to dye it much darker. For about a year I dyed it every 5 weeks with the result that my hair was in such a horrible state that I had to cut it off to my earlobes and let the rest grow out. Mental note: If you dye your hair let a professional do it and don’t dry it out further by using a volumizing shampoo!! Generally speaking my hair is rather dry but I suffer from a greasy scalp, due to this the past 4 years were dedicated to finding shampoos and conditioners that would not weigh my hair further down but still keep it intensely moisturized. And yes, it took me until now to find a combo that I am content with. One important step on my way, was to change around my way of washing my hair, by only applying conditioner from my earlobes down and the shampoo only on my scalp, ever since then my hair has been doing a lot better. In the picture above you can see the stuff I use every time I wash my hair. This shampoo leaves my hair shiny, clean and deeply moisturized (yes, the shampoo alone!). It worked miracles for my hair. The scent is very light and fresh and not at all your typical heavy oil smell. As mentioned before I apply the conditioner from the earlobes down. It is a thick yellowy paste of the same scent as the shampoo and is as well deeply moisturizing without weighing my hair down. I might switch this shampoo out once it is empty, in fact I will have to, since it has been discontinued. This shampoo stands for the fact that I always pair my argan oil shampoo with a shampoo for greasy hair, I know this sounds as if they would cancel each other out but in my case they really don’t. On the other hand the Kérastase shampoo does not work as spectecularly as I would like and I won’t miss it much when I run out. My next candidate to try out is actually the Redken shampoo for greasy hair. Again a ‘I can’t live without this and will repurchase’-product. This mousse gives my hair longlasting volume and for some reason it holds my grease at bay, when I use this product I get a lot later greasy than if I don’t. I just massage it into my roots before blow- drying my hair (again I only blow-dry the scalp and at a very low heat-setting). This is my latest addition and it caused an absolute addiction. I use this oil every day and sometimes twice. For one I put 4 pumps of this through my hair before I wash it, before blow-drying I put two pumps through the still wet ends, and every day after brushing out my hair I put a pump of this again through my ends. Nothing has ever left my ends so soft and healthy-feeling than this product. My hair absorbs the oil fully and does not become weighed down at all no matter how many times I use it or how much I pack on. Using hot tools on my hair used to be a complete nightmare because my ends would need days and days to recover from it, this oil erases the dryness caused by the heat from my hair and leaves it soft and smooth without ruining the curls, I couldn’t rave about this enough. Another plus is that it comes at a significantly lower price point than Moroccan Oil. I use this whenever I wash my hair but mainly to use it up. This doesn’t seem to do anything for my hair but it doesn’t hurt it either. I used to wear these every day but the argan oil conditioner and the hair oil have made them pretty much redundant and I only use them when my hair seems to need an extra kick. 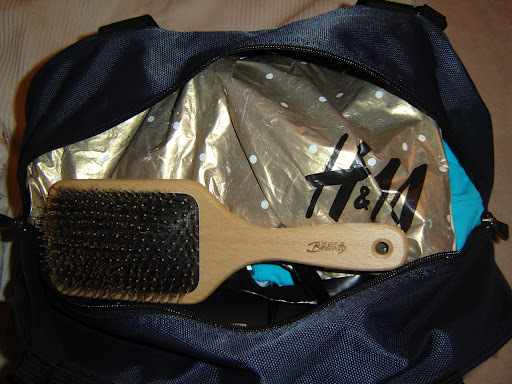 I still love these though I think they are great products and definitely worth checking out! Smells like dead grandma but this is certainly one of the best hairprays I ever had and worth every penny, it gives me all the hold I need but leaves my hair feeling soft and natural, in other words it does exactly what it says it would. I don’t think this is available outside of continental Europe but than again it is not too unique either. This comes as a clear jelly, smells nice, gives my hair a nice shine and gets the job done. I mainly use this to calm down fly-aways when I put my hair up in a ponytail or a bun. My go- to heat protectant. I love the smell and it makes my hair very glossy. I use this whenever I use hot tools. I might switch this out for something that protects my hair more from drying out but for now this bottle is still quite full and I will use this up. 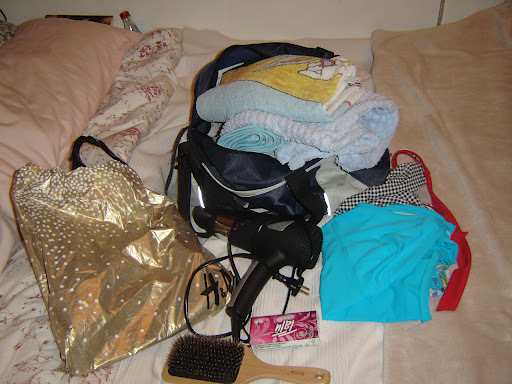 Was ist in meiner Schwimmtasche? Seit einer Woche gehe ich wieder regelmäßig schwimmen. Aus Zeitmangel kann ich das nur in den Ferien betreiben. Idealerweise schwimme ich 2- 3 Mal die Woche 1000 Meter und sobald ich das in 20 Minuten schaffe, schlage ich noch mal 500 Meter drauf. Im Moment bin ich bei knapp 30 Minuten, ich habe also noch einiges vor mir :). Das Problem mit Schwimmbadwasser ist, dass es meine sowieso schon trockene Haut und Haare noch weiter austrocknet und deswegen musste ich einen Weg finden, das wieder zu beheben, sobald ich aus dem Wasser komme. 1. Balea Creme- Öl Dusche Marulanussöl und Milchprotein: Riecht soooo lecker und ist sehr cremig und pflegend. 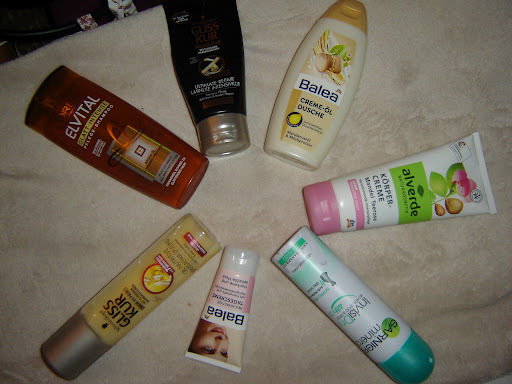 Im Gegensatz zu einer anderen Creme-Öl Dusche, die ich hatte ist sie auch nicht zu flüssig und lässt sich daher unfallfrei der Flasche entnehmen. 2. (gegen den Uhrzeigersinn) Gliss Kur Ultimate Repair 1- Minute Intensiv Kur: Wollte ich sowieso aufbrauchen. 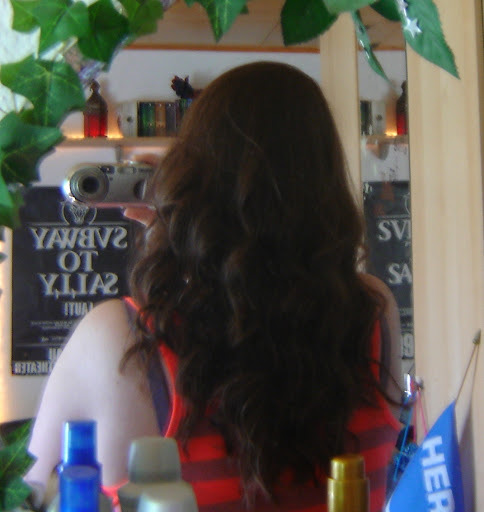 Riecht gut und ist pflegender als mein aktueller Conditioner. Macht meine Haare schön weich und glänzend. 3. Elvital Glatt- Intense Shampoo: Meine Haare sind zwar schon glatt, aber das im Shampoo enthaltene Argan- Öl macht meine Haare weich und seidig. Ich benutze seit einiger keinen Conditioner mehr am Oberkopf, nur noch in den Längen, dieses Shampoo sorgt dafür, dass meine Haare sich auch am Oberkopf anfühlen, als hätte ich Conditioner benutzt, aber ohne sie zu beschweren. Benutze ich direkt vor dem fönen in den Längen, um die Haare kämmbar zu machen. 5. 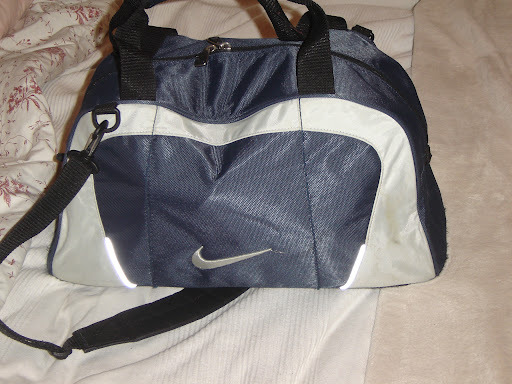 Balea Reichhaltige Tagescreme: Ich brauche nur eine winzige Menge um meine Haut mit all der Feuchtigkeit zu versorgen, die das Chlorwasser ihr entzogen hat. 6. 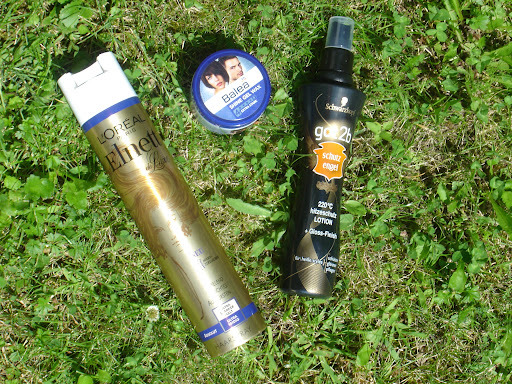 Garnier Mineral InvisiDry 48h Non Stop: Mein Lieblingsdeo. Wirkt super und riecht frisch, aber nicht zu stark, das heißt es legt sich nicht mit meinem jeweiligen Parfüm an. 7. alverde Körpercreme Mandel Teerose: Eine der besten Cremes, die ich je hatte ❤ Duftet sehr angenehm nach Rosen, ist sehr reichhaltig, was für meine sehr trockene Körperhaut ausgezeichnet ist, braucht aber nicht Stunden um einzuziehen. Sie macht meine Haut weich und samtig und das Gefühl hält den ganzen Tag an. Ich weiß, ich bin spät dran aber hier ein kleiner Überblick über die Produkte, die dieses Jahr für mich herausgestochen haben aus der Masse und die mich hoffentlich auch in Zunkunft begleiten werden. 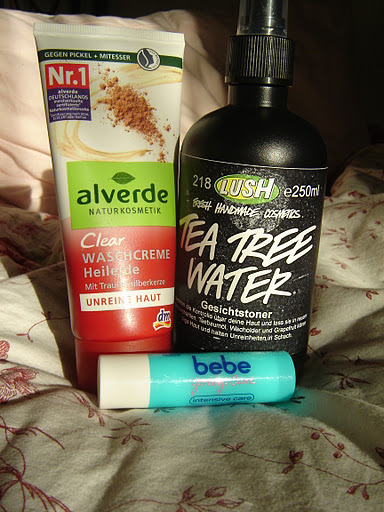 Wie schon in einem anderen Blogpost erwähnt war einer meiner ständigen Begleiter die alverde Clear Waschcreme. Kein anderer Cleanser sorgt so wie dieser dafür das mein Hautbild schon direkt nach dem ersten Verwenden besser aussieht und es trocknet meine Haut auch nicht aus. An Handcreme habe ich im letzten Jahr zwei neue Lieben entdeckt, die ich beide nicht mehr missen will. Unterwegs habe ich immer meine Handsan Intensiv- Handcreme 5% Urea dabei, die einen wunderbaren Job tut und meine Hände schön weich macht ohne einen glitschigen Film zu hinterlassen. Der Duft ist angenehm aber nichts besonderes. 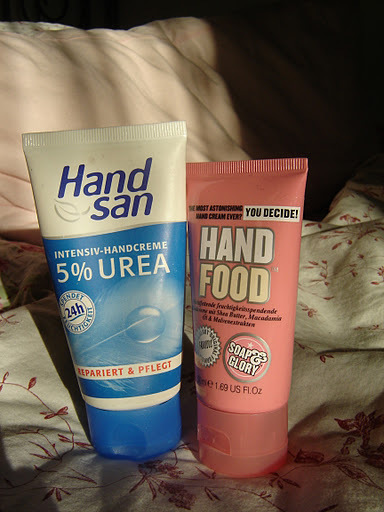 Ganz anders bei der Soap and Glory Handfood. Auf Empfehlung von Fleur de Force gekauft und mich Hals über Kopf in den Geruch verliebt. Sie ist nicht ganz so feuchtigkeitsspendend wie die Handsan Creme, aber OH MEIN GOTT der Duft!!! Ich kann Düfte nicht gut beschreiben, alles was ich weiß ist, dass das hier mein perfekter Duft ist (angeblich riecht sie ja genauso wie Chanel Mademoiselle, was mich bei 60€ pro Flakon in leichte Verzweiflung stürzt). Gott sei Dank verfliegt er erst nach einer ganzen Weile. Auch sie hinterlässt keinen Film. P.S. 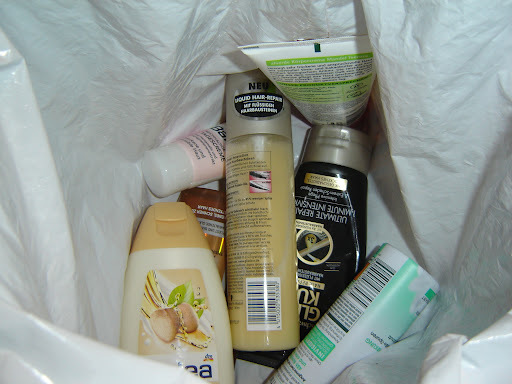 Mittlerweile ist auch das Soap and Glory Clean On Me Duschgel eingezogen, das genauso riecht wie Handfood und wenn ich meine Bodylotion aufgebraucht habe darf The Righteous Bodylotion auch noch einziehen (riecht ebenfalls wie Handfood). Ich bin ein klitzekleines Bisschen besessen. Ich habe in Sachen Haarpflege einiges geändert (dazu ausführlich in einem späteren Blogpost). 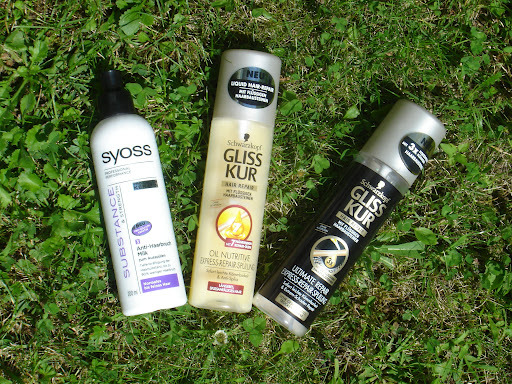 Wichtigste Helferlein sind dabei meine Gliss Kur Leave in-Conditioner. Sie sind wunderbar pflegend und lassen sich durch den feinen Sprühkopf gut verteilen. Ich sprühe sie nur in die Längen und das vor jedem Durchkämmen, in feuchtem und trockenem Zustand meiner Haare. Conditioner wirken entwirrend und geben meinem trockenen strapazierten Haar noch mal eine extra Portion Feuchtigkeit. Seit ich sie benutze hat sich der Zustand meiner Haare stark verbessert. 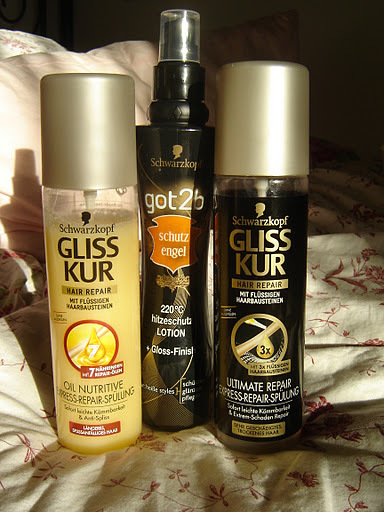 Das Oil Nutritive verwende ich nach dem Waschen im feuchten Haar, das Ultimate Repair vor jedem Kämmen zwischen den Wäschen. Meinen geliebten Schutzengel von got2b benutze ich immer wenn mein Haar irgendwie mit Hitze in berührung kommt, sei es beim Benutzen von meinem Glätteisen oder dem Fön. Es riecht gut, tut soweit ich das beurteilen kann seinen Job und verleiht meinem Haar Glanz. Ich habe dieses Jahr in der Matchmaster von MAC endlich eine Foundation gefunden die nicht nur perfekt mit meinem Hautton verschmilzt (MAC NC15 ist mir zu dunkel!) sondern auch perfekt für meinen Hauttyp ist. Ich liebe sie. Wenn meine Haut ist wie im Moment, hat sie die perfekte Deckkraft, sie fühlt sich federleicht an, als wäre sie gar nicht da und äh, ich liebe sie! 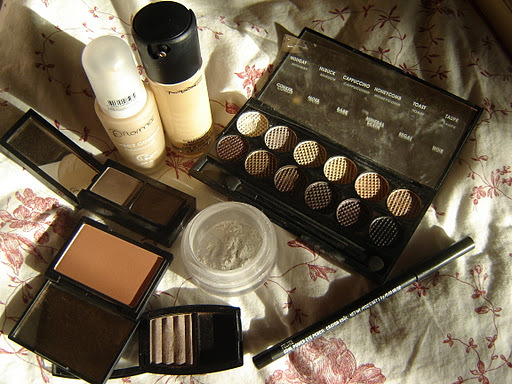 Und ich habe tatsächlich NOCH eine Foundation gefunden, die zu meinem Hautton passt (sie ist sogar fast zu hell oO) und zwar die Perfect Coverage Foundation von Flormar. Sie ist reichhaltiger und schwerer, hat aber auch eine höhere Deckkraft. Am Anfang hatte ich ein bisschen Manschetten vor der Foundation, da sie mit Mandel- und Olivenöl angereichert ist, aber meine Haut glänzt auch nicht schneller als sonst wenn ich diese Foundation trage und besonders jetzt im Winter fühlt sie sich wunderbar an. Weiteres Staple dieses Jahr war mein Catrice Eyebrow Set. Meistens benutze ich die dunklere Farbe wenn es etwas softer sein soll die hellere. Das Puder hält gut und ist nicht zu rot für meine dunklen Brauen. Mein meistbenutzter Blush war eindeutig der Suede von Sleek. Schöne matte caramellige Farbe die meine Haut ein schönes natürliches warmes Finish verleiht. Liebste Eyeshadows waren der Hot Chocolate von Rival de Loop, ein silbriges Taupe, dessen rötliche Untertöne das Grün in meiner Augenfarbe betonen und die Sleek Au Naturel Palette, für mich besser geeignet als die Naked Paletten von Urban Decay, da ich (außer wenn ich Hot Choclate trage) eher zu matten Tönen tendiere. Wichtigster und bester Kajal eindeutig Kohl Power Pencil in Feline von MAC. Keiner sonst hält 10 Stunden auf meiner Wasserlinie und ich hatte auch noch nie Probleme damit dass er verläuft. Was noch bleibt ist loser Translucent Powder. 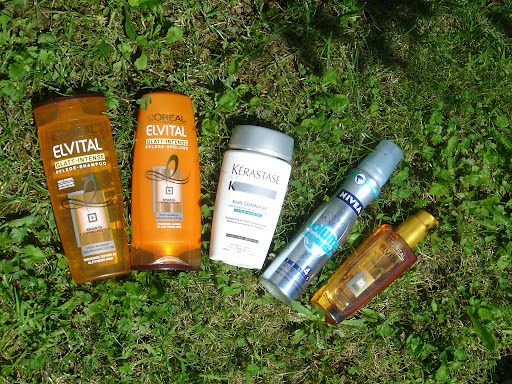 Im Moment benutze ich einen aus einer essence TE wenn dieser dann aber bald leer ist, kommt entweder das Standard- Sortiment Pendant von essence oder Catrice an die Reihe. Die losen Puder halten länger -in jeglicher Hinsicht- und sie geben meiner Erfahrung nach eine feineres Finish als gepresste Puder. Mein Basecoat des Jahres (den ich zu meinem Entsetzen neulich bei p2 nicht mehr gefunden habe, muss wohl in einem Sortimentswechsel rausgeflogen sein 😦 ) war der Hypoallergen+Quick Dry Basecoat. Klarer Basecoat, der dafür gesorgt hat das meine Nägel sich nach einer stressigen Phase wieder erholt haben. 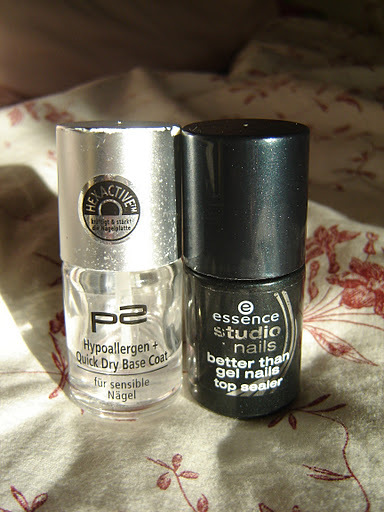 Und der beste Topcoat aller Zeiten ist der essence studio nails better than gel nails top sealer. Super schnell trocknend, super glänzendes glattes Finish und sorgt dafür das sogar Problemlacke sich benehmen. Bestes Produkt ever und jeden Cent wert! Weil es mir bei über 80 Nagellacken schwerfällt einen besonderen rauszupicken habe ich beschlossen meine Lieblingsmarke zu wählen und das ist mit Abstand Catrice. Ich besitze 12 Farblacke und einen Topcoat und ich habe jeden einzelnen im Verlauf des Jahres mindestens einmal getragen und (bis auf einen LE Lack) haben alle eine großartige Pigmentierung/Deckkraft und halten außergewöhnlich gut. Die Qualität dieser Lacke ist nicht nur vergleichbar mit Highend Lacken, sondern zum Teil sogar besser (auch hier ausführlicher Blopost folgt). Besonders sind auch die außergwöhnlichen Finishes wie zum Beispiel der violette Hololack Dirty Berry. Und mit dieser Lobeshymne endet mein ellenlanger Blogpost, kudos an alle die bis zum Schluss durchgehalten haben. Ich habe mir dieses Jahr in Sachen Blog viel vorgenommen, hoffentlich schaff ich alles. Drückt mir die Daumen! Balea Creme- Öl Dusch Peeling Indian Chai (Limited Edition [*wein] 200ml; 1,45€; dm ) Auf dieses Baby bin ich aufmerksam geworden durch YouTuberin Empathy25, die vor allem von dem wunderbaren, nicht ganz leichten Vanillegeruch schwärmte. Ich liebe Vanille, ich bin ein Peelingjunkie, also los zum nächsten dm gewandert, gerochen und…. es war Liebe! Der Geruch ist absolut traumhaft: warme, süße Vanille mit einem Anklang von Gewürzen, perfekt für Weihnachten. Das Produkt an sich ist okay, aber nicht überragend. Der Peeling- Effekt und die Pflegewirkung sind gut und für jemanden, dessen Haut weniger trocken und stressig ist, als meine, ist es vermutlich besser geeignet, aber gerade weil es LE ist und ich nicht weiß, wie lange es es noch geben wird und dieser Duft einfach perfekt ist, werde ich es so lange nachkaufen, wie es im Laden steht. Bunkern werde ich aber nicht, wenn weg dann weg. alverde Clear Waschcreme Heilerde (100ml; 2,25€; dm) Wo mein Körper zu trocken ist, ist mein Gesicht zu ölig und neigt zu Unreinheiten (immer noch, man sollte meinen das legt sich, wenn die Pubertät erst mal rum ist ). Als es mal wieder besonders schlimm war, habe ich mir die alverde Waschcreme gekauft und war fasziniert: Nicht nur scheint sie meine Poren zu verfeinern, sondern auch die Unreinheiten gingen merklich zurück und klangen wesentlich schneller ab, als vorher. Die Creme trocknet meine Haut nicht aus und hilft dadurch, dass meine Haut weniger überschüssiges Öl produziert. Ich bin rundum zufrieden und möchte diesen Cleanser nicht mehr missen!